Drury will open tomorrow night against Atlanta centering the third line. What? So what would appear to be a trip down Ranger memory lane, where some of the best veteran hockey players came to New York to pay for and melt away into retirement, is not what it seems. Tom Renney, Grand Overlord Coach of the NY Rangers is putting Chris Drury on the third line. Yes folks, you heard it here -- our #1 free-agent pick Chris Drury, courtesy of the Buffalo Sabres and now a $7 million a year NY Ranger, is centering the third line between rookies Petr Prucha and Ryan Callahan. Crazy or brilliant? The sad truth is this is probably one of the better ideas all season. With all the talent on the first and second lines (Jagr, Gomez, Straka, Shanny, etc.) and very little production from any of them, both rookies Prucha and Callahan have been two of the more effective players during the season and Chris Drury might just have that leadership and experience to shape front-line attention. So far, the Rangers and management have attempted to shape the team around the play of Jamomir Jagr, right wing extraordinaire, so it is refreshing to see them taking advantage of this newly improved Ranger youth movement. 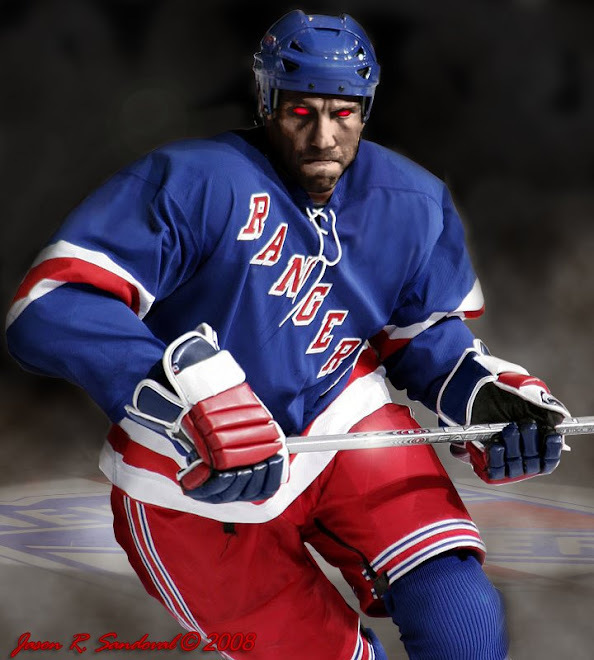 Surely, these New York Rangers can beat the Atlanta Thrashers - as the Philadephia Flyers beat them 4 - 0 last night and the fact that the Thrashers have relatively zero defense. I believe the above lines can work and The Dark Ranger will be okay with 3-3-0, so a win is a necessity. If the Blueshirts lose to a team that is 0-6 this season, then we have bigger problems! Hossa looks like he's out with a groin injury. Apparently Dawes may skate with the first line. I hope you're right about Dubinsky, but knowing Renney, it will be Betts with Straka and (goalless) Shanahan. Dawes should smoke the Thrashers tonight -- it is an early chance for him to make another impression, keeping him in the Big Leagues. Here's hoping....I like this kid.